Discussion in 'Gynaecology and Obstetrics' started by Nada El Garhy, Aug 4, 2018. A couple from San Diego County is suing the Tri-City Medical Center in Oceanside for medical malpractice, assault and battery, and other charges after an obstetrician on staff allegedly performed an emergency C-section on the woman without proper anesthesia. According to the initial complaint filed to the San Diego Superior Court of California, Delphina Mota, age 25, “underwent excruciating and unnecessary pain and suffering, until she eventually passed out from the pain” when Dr Sandra Lopez and her surgical team strapped down Ms Mota’s limbs and cut into her abdomen and uterus to remove her infant daughter following loss of a readable fetal heartbeat early in the morning of November 16, 2017. The anesthesiologist named in the lawsuit, Dr David Seif, had allegedly not responded to multiple pages by Dr Lopez, nor had any other anesthesiologists on staff. So, Dr Lopez proceeded with a C-section procedure without administering the necessary pain-blocking medication. “During that part of the surgery, prior to the arrival of Defendant David Seif MD, [and other unnamed staff defendants], Plaintiff Delphina Mota was crying and screaming at the top of her lungs that she could feel everything that was happening, and was also pleading for help and for the Defendants to stop cutting and hurting her,” stated the suit prepared by attorney Norman Finkelstein. The document does not list the monetary amount Mota and her fiancé, Paul Iheanachor, are demanding in damages for infliction of permanent physical and psychological injury, but the Los Angeles Times reports that a claim filed with the hospital prior to initiation of the legal case asked for $5.75 million. Their daughter, Cali, is now eight months old and healthy. The supposed horror story began on November 15, 2017, when Mota was admitted to the hospital for induced labor; she was more than 41 weeks pregnant at the time. After consulting with Dr Lopez, Mota and Iheanachor agreed to a birth plan using Pitocin augmentation – a form of induction wherein a synthetic version of the hormone oxytocin is infused into the body through an IV, causing the uterus to contract. Mota also requested an epidural to ease the pain of the expected upcoming vaginal delivery. Finkelstein writes that Dr Seif administered an epidural at approximately 11:06 PM; at around 11:20 PM, the Pitocin drip was started. But a little over an hour later, Mota – who had gestational diabetes – experienced a blood pressure drop, so the Pitocin was temporarily discontinued. Then, at about 5:20 AM, concerns over the absence of a fetal heart rate on monitors prompted Lopez to call for an emergency C-section. 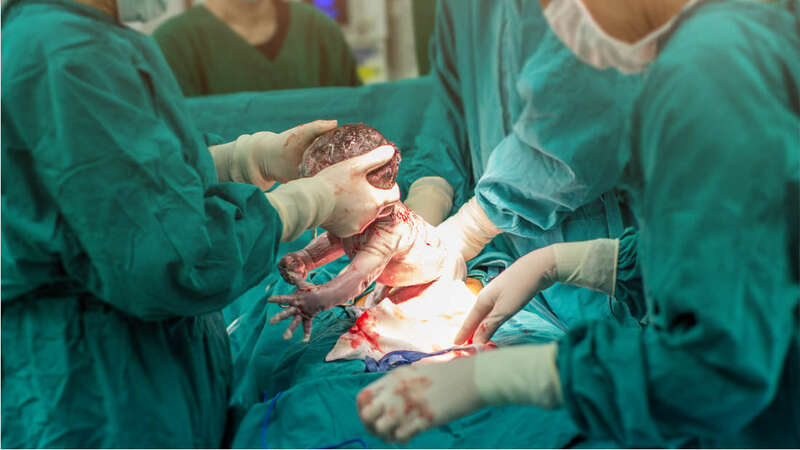 Per the suit, the epidural that had been previously administered had successfully numbed Mota from her waist down but had absolutely no effect on the surgical site for the C-section. Mota told the Los Angeles Times that she remembers hearing Lopez repeatedly telling her staff to “Page him, keep paging him”, then suddenly felt a burning, cutting sensation that caused her to lose consciousness.